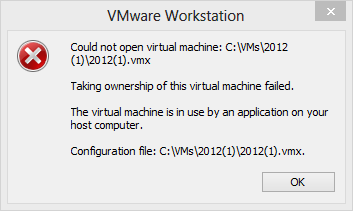 The virtual machine appears to be in use. 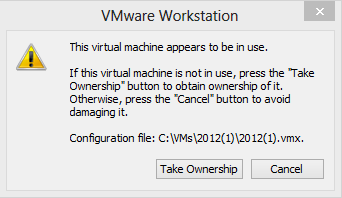 If this virtual machine is not in use press the “Take Ownership” button to obtain ownership of it. Otherwise press the “Cancel” button to avoid damaging it. I knew it was not in use, as there was only me using my laptop. So I figured VMware had some files ‘locked’. Navigate to the folder that holds the VM’s files, (Note: The path is on the error message above). Locate any folders that have a .lck extension appended to their name (as above), and move them to another folder. Then attempt to power on your VM.